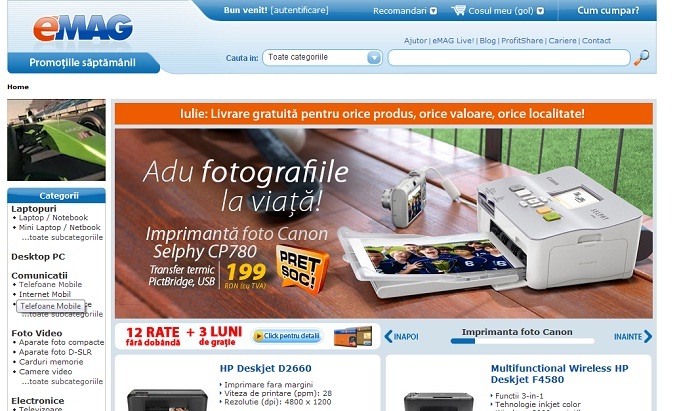 Online retailer eMag.ro has sold over 240 products which were mistakenly discounted by more than ten times in some cases, due to a website technical error, the company's manager Radu Apostolescu wrote on the firm's website. The mistake has a cost of around RON 132,000 (the equivalent of around EUR 31,000) for eMag.ro, which has decided to validate the sales even so. The orders at the wrong prices were placed on the retailers website during a period of seven hours, until 9,30 this morning, when the system was shut and the error fixed. In total, the sale prices of 468 products had been affected. “Out of respect for our clients, those who ordered at lower prices than the usual offer will receive the products at the lower price, while those who got the higher prices by mistake will get the products at the correct list price,” said Radu Apostolescu. For example, 8 TV sets were displayed with an average price of RON 180, instead of RON 2,700, the normal price; several notebooks were listed at a price of RON 130, instead of the normal RON 1,800. “Probably many will jump to label this as a loss, but we will consider it an investment, true, a bit atypical, an investment in the trust of those who buy from us every day. On a long term, mistakes are inevitable, from humans and machines alike, but they offer us unexpected opportunities to show how we understand to solve less usual situations,” concluded Radu Apostolescu.